A few of weeks back, while perusing the New York Times Magazine, I stumbled on a several images I found simply . . . remarkable . The images accompanied an article titled “17th-Century Modernism ? “ Which piqued my interest even more, because my own aesthetic is bent in a distinctly modernist direction, and the prospect of “modernism” being connected to a three hundred year tradition of painting, was well worth investigating. The article turned out to be a review of the book “Tantra Song” a collection of contemporary anonymous paintings from Rajasthan, India, compiled by french poet Franck Andre’ Jamme, documenting the practice of creating visual images for use in private meditation (a practice dating back to the sixteen hundreds). After reading the review then visiting the publisher’s web site Sigliopress.com, I knew I needed to own this book. “Tantra Song” features over 50 illustrations of these timeless and amazingly beautiful paintings. “Tantra Song” is published by Siglio Press and includes contributions by writer and Berkeley Art Museum Director Lawrence Rinder, poet and art critic Bill Berkson, and scholar André Padoux. A few days after receiving my copy of “Tantra Song” another package arrived from Siglio Press. A small folio with “siglio EPHEMERA #5” stamped on the front and containing a collection of cards by Selena Kimball, and two booklets, one featuring a poem by Henri Michaux. The second collages by Richard Kraft. 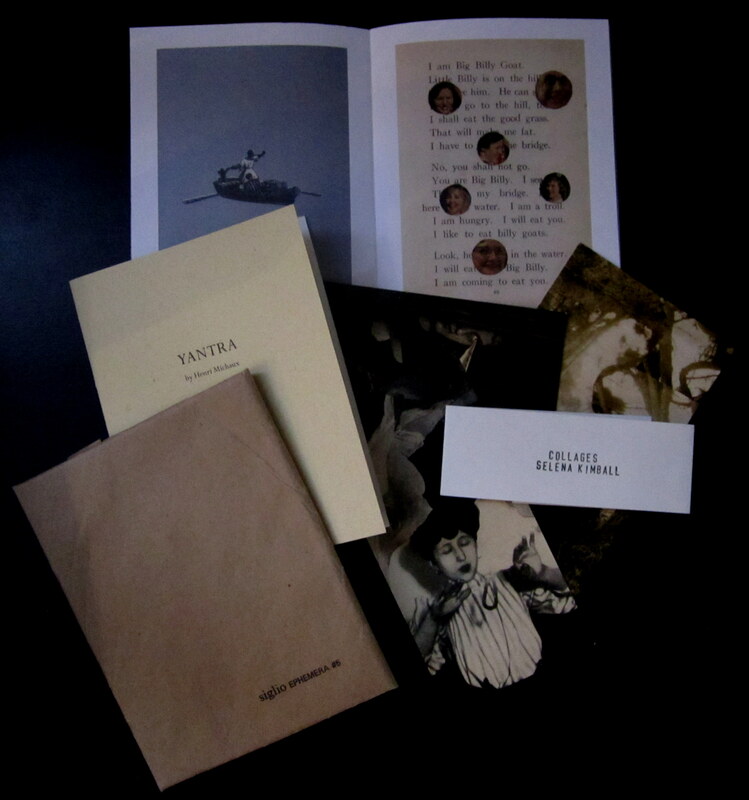 The siglio EPHEMERA folios are based on Dada, Surrealist, and Fluxus printed materials, and are created in collaboration with artists and writers the folks at Siglio Press admire. Siglio Press gives these editions away for free ” in the hope that we (Sliglio Press) delight or suprise, provoke or engage, in some unexpected way” And for myself, Sliglio Press has far exceded that simple goal.